Snow preparation always includes milk, eggs and bread, yes? AND of course, french toast. The blizzard of 2016 left me with extra cake. Leftover cake? WHAT’S THAT? What’s a girl to do? It’s pan fried, frosting and all! 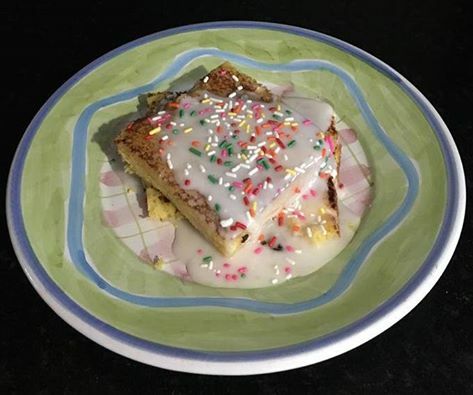 Chill the cake overnight, mix the ‪#‎blizzard2016‬ eggs and milk with a dash of cinnamon, dip the chilled cake slices in the mixture and fry until lightly browned. Just like traditional french toast but completely upcycled! Takes french toast from tasty to decadent!!! With or without the powdered sugar glaze, it makes me want to bake “leftover” cake more often. The glaze is 1/2 cup of powdered sugar, 1/4 teaspoon vanilla and 1/4 teaspoon milk. Whisk until smooth and top the toast! Don’t forget the party sprinkles!